Hmmmm ... 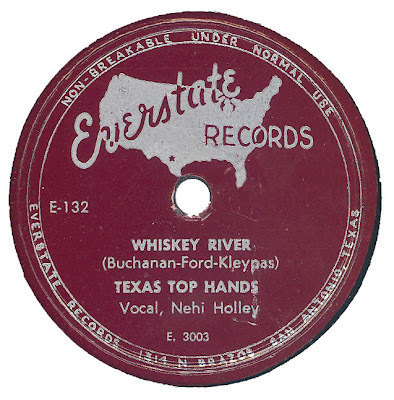 I wonder if this inspired Johnny Bush's "Whiskey River"? A great record. This whole Everstate series is much appreciated. I still can't figure out how you get hold of these records in England. A mystery. It is funny how on many of these releases it is "Tophands" on one side and "Top Hands" on reverse. You have it listed here as "Tophands" but "Whiskey River" label shot shows "Top Hands". Is it "Tophands" on "Waltz..." side?